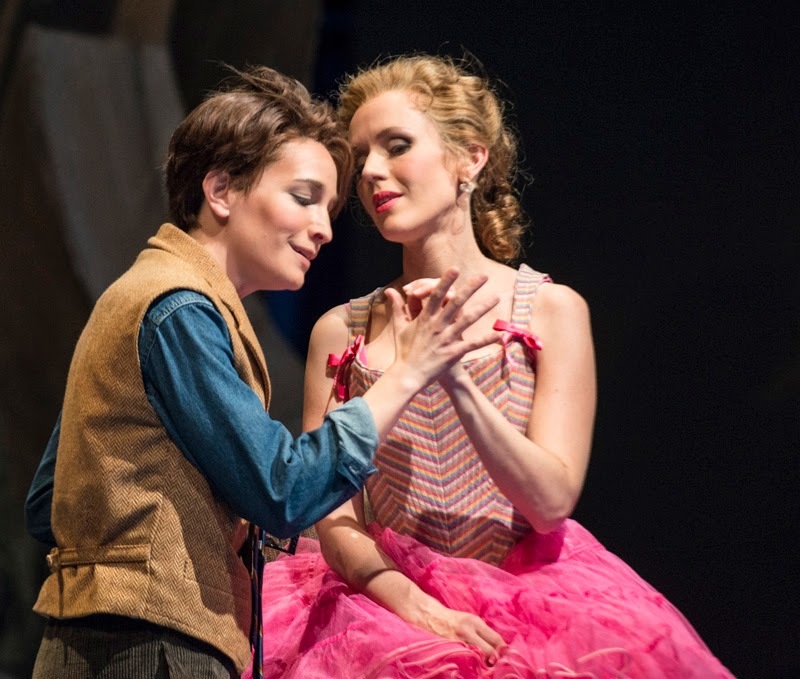 Zerbinetta is one of the most demanding roles ever written for high coloratura, and Sarah Coburn is taking on the challenge for the first time this season at Seattle Opera. 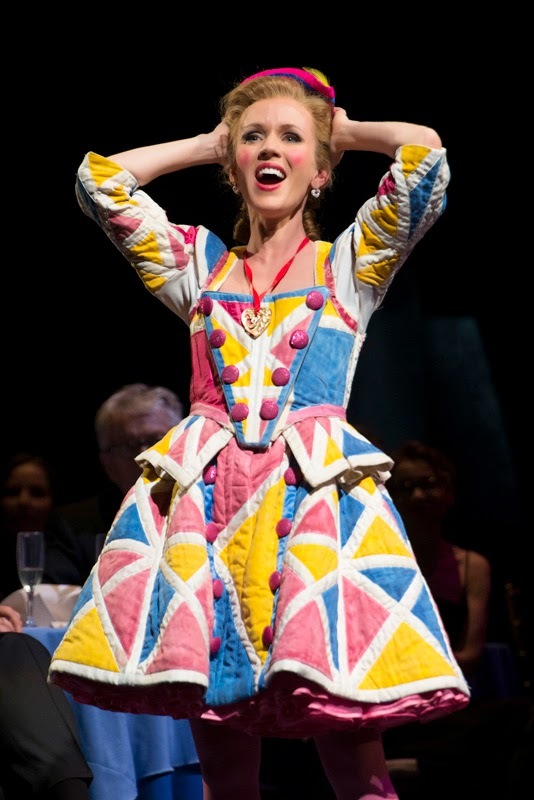 Coburn is no stranger to Seattle audiences, who enjoyed her Daughter of the Regiment last year and her Rosina in The Barber of Seville in 2011. Seattle’s die-hard opera addicts remember Coburn as a promising Young Artist more than ten years ago. This versatile singer, who has sung in English, Italian, French, and now German at Seattle Opera, is balancing an important career as a singer with being a mother of two—and now expecting a third. Sarah Coburn sings a passage from Zerbinetta's "Als ein Gott"
Sarah, congratulations on your first Zerbinetta! Had you sung the big aria before? Nope, I hadn’t studied a note of it. I learned the whole role from scratch, which has been a wonderful challenge—no old bad habits! It’s one of my favorite roles now. It’s such a huge role. How long did it take you to learn it? Quite a while—with two little kids running all over the place, it’s can be hard to find time to sit down at the piano and study new roles. I’ve had to become very efficient with my study time. For this and for Rosenkavalier, my husband speaks German very well so he helped—he would quiz me. Take us through a normal performance day for you. I usually try to take a little nap in the afternoon, and sometimes I can sync that with my youngest daughter’s nap. Usually I eat about 2 pm, and then bring a sandwich with me to the theater, to my dressing room. No garlic or onions! We pregnant women are extra sensitive to smells. With my colleagues I have been high maintenance in the smell department; sorry, guys! Let’s talk about Zerbinetta. What does she learn in this opera? I thinks it’s more a question of confirming what she already knows. For all her theatricality, she really isn’t very dramatic; she knows love comes and goes, and you just need to go with it. At the end, she may walk off with the Composer, and they’ll have a wonderful relationship for a time...but not forever. What’s the appeal of the Composer, for Zerbinetta? He’s different from every other man she’s met. He’s innocent, idealistic, unapprochable. She’s more jaded. She’s had lots of relationships, and I think she’s used to men treating her a certain way. “People think they know me,” she says, “because I play the coquette onstage. But there’s more to me than just that!” And she reveals some vulnerability, in her duet with the Composer, which appeals to him. But he’s not going to transform her into a total romantic. No. Nor an honest woman. I think she has learned to take life as it comes. I don’t think her past was all that peaceful. That’s right, she tells Ariadne that she (Zerbinetta) has been marooned on these desert islands herself. Can you give us the story of Ariadne auf Naxos from Zerbinetta’s point of view? Sure, I was hired to do my thing, singing and dancing, part of this comedy team. We do this all the time—we have a fabulous little show, entertaining, light, and funny. In this case we’re supposed to follow this really serious, long, heavy opera, and I’m worried that the audience is going to be worn out by the time it’s over. But then we find out that we have to do both shows at the same time, and everyone except Zerbinetta freaks out about it. I just think, “Whatever...we’ll make it work!” I’m used to being quick on my feet, in situations that require spontaneity and flexibility. We’re not a high-budget operation and we’ve probably had to deal with worse before. Does she like doing the superimposed comedy-meets-tragedy mash-up? She likes a challenge. She likes competing with the Prima Donna; that makes it fun. As a singer I identify with that; I don’t like being onstage alone. It’s more comfortable for me if there’s a colleague to push and pull, to compete with. So we interrupt this opera, and try to superimpose comedy on top of this tragedy. And then, when the guys are not successful in cheering Ariadne up, I send them away and take up the challenge myself. And then you sing a 15-minute long aria. How on earth do you do that? Is there anything else like it? The mad scene in Lucia, maybe? No, that’s different, because you don’t have to look pretty or calm. For me that’s the easiest part of the night, in Lucia, because you can just let go. Zerbinetta is absolutely different, vocally. It’s not bel canto. It needs to be placed very deliberately. Much of it is disjointed; leaps that don’t come naturally. And Zerbinetta is the opposite of Lucia here—she’s absolutely in control. Cute, and charming, and flirtatious, and in control, yes. With a daunting new role like this, what I have to do is convince myself that I’ve done it a million times. It needs spontaneity, freshness of thought. My wonderful teacher, Rita Shane, always said, "You don’t recreate; you always create.” You may have had a great performance the day before, but if you try to do exactly the same thing again, you will fail—you’re not the same exact person that you were the day before. It’s tricky. What’s the weirdest thing that’s ever happened to you onstage? I broke my little toe at an orchestra tech for Rigoletto—I caught my toe on a table as I was running across the stage, and as I came over to my father, I looked down and saw my toe sticking out at this weird angle. I said to him: “My toe is broken, please don’t step on it!” So I covered it up with my nightgown so I wouldn’t have to look at it, and we sang the duet, and he’s telling me “Piangi, fanciulla,” which means, “Weep, child...” and I did! Real tears! Real tears that day! What’s the biggest public misconception about opera singers? A lot of people say to me: “You’re so small! How can that big sound come out of your body?” There’s a misconception that you have to be a big person to have a big voice. What you need is a big head, with space for the sound to resonate. I have a very large head for my body size. I once shared a wig with Placido Domingo! (It was Tan Dun’s The First Emperor at the Met, we had these long Chinese-style pony tails.) There’s a terrible trend going on right now, of changing the way opera is cast, to get people who look good onscreen. 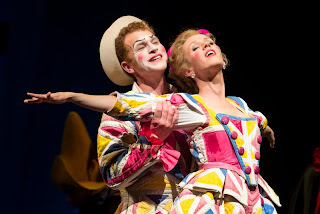 Opera is about voices, not looks. Opera-lovers are people who’ve gotten hooked at some point by the experience of a human voice that just nails you to your seat. That’s what makes you an opera-lover for life, and there’s nothing else like it. Renee Fleming singing Arabella did that to me, and Deborah Polaski and Deborah Voight in Elektra. And Lawrence Brownlee. I’ll never forget, I was 23 years old, we were in the Met finals, and Larry sang that spectacular aria from Italiana. That’s what it’s about.